Last December I took a fly-fishing trip to the South Island of New Zealand. It’s a trip I’ve been wanting to make since I was 14 years old. 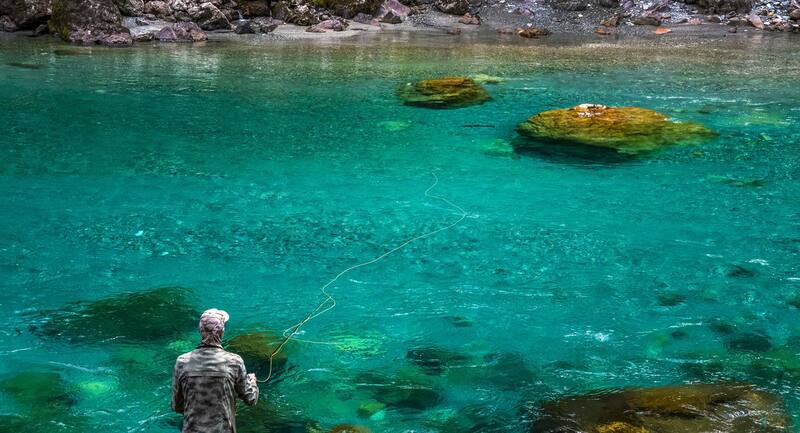 New Zealand is certainly not a secret destination for untouched wilderness fishing anymore. The lure of big brown trout and decades of promotion has seen to that. These days you’ll find difficult fish which must be spotted, stalked, and carefully targeted if you have any hope of success. I’ve had plenty of other challenges to tackle in over a decade of competitive fly fishing but the unique challenge of hard-won brown trout in exceptionally clear water is what drew me to New Zealand. 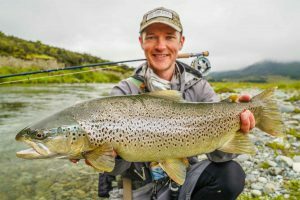 If you are planning a trip to New Zealand, or if you have local waters where you can sight fish, here are some tips to help you spot more fish and be more successful on your trip. If you would like to read more about my trip, you can find the rigs I used in this post and read about a couple of days I had on the water in this post. Color is everything. A lot of anglers I’ve fished with have asked me how I can spot fish which they can’t see when we’re standing side by side. For me, it’s all about looking for inconsistencies in color. Trout are certainly capable of matching their surroundings with chameleon like camouflage. However, if you pay close attention to the river bottom, with training you will spot colors or contrasts on the river bottom which seem out of place. These differences can be subtle, but over time fish can be spotted fairly easily with repetition. Regional or species-specific patterns in trout coloration can help inform your color search. For example, if you are fishing in a river with rainbow trout, their pink or red lateral flanks will often show in the water. In New Zealand, the brown trout regularly exhibit a greenish hue on their back and silvery or orange flanks. Looking for those stacked color patterns helped me spot a lot more fish on my trip. Learn to read water better and you’ll be able to spot fish more easily. If you are capable of predicting where fish will hold when you are blind fishing, these same predictions will help inform your sight fishing. 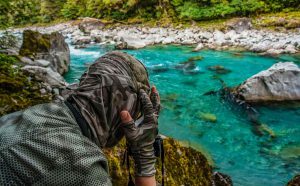 Sure, you can spot fish by looking at every inch of the river methodically but you’ll be more consistently effective if you focus most of your visual effort on target rich areas of the river. If you’d like some more information on how to read water based on variables like water temperature and hatches, pick up a copy of my new book Tactical Fly Fishing: Lessons Learned from Competition for All Anglers or our instructional film Modern Nymphing Elevated: Beyond the Basics. Pay attention to the background. Incident glare is made far worse if the bank on the far side of the river is light colored and reflects a lot of light. If there is something dark colored, like a tree, you’ll notice a lane corresponding to that object with much less glare that lets you see more clearly into the water. If you can line up that darker lane of water with the target area you are trying to spot fish in, you’ll have a much easier time spotting fish. There is a reason for the phrase “a bird’s eye view.” Another variable that will vastly improve your view into the water is your height above the river. While in NZ, we regularly climbed bluffs and hills to gain elevation over the river. From elevated vantage points, fish became obvious in places where we couldn’t see the bottom from the river’s edge. Your elevation has to be weighed against the probability of fish seeing you as well. If you are a long way from the river the fish may not perceive you as a threat, but if you loom over the fish near the river you’ll set off a piscatorial air raid siren and watch your quarry scurry into the depths. This problem can usually be avoided by using trees or grass to break up your silhouette or to hide behind. Wait for the window. The surface of the river can look like a turbulent mess at times. Swirling currents can obscure your view into trout hiding depths. However, if you are patient, there will often be periodic pauses in the turbulence when surface currents smooth. This phenomenon looks exactly like a window opening your world to the water below. Sometimes a window can take a long time to appear but in likely locations it pays to wait. I make a habit of looking upstream for windows that are coming my way to prepare my focus for when they arrive. This tactic often rewards me with a thumping heart as a large previously hidden trout pops into view. Take turns being a spotter. One of the best ways to make a day of sight fishing more successful is fishing with a capable friend. No angler is going to spot all of the available fish in the river. Two sets of eyes are always better than one. On smaller rivers, it can pay to put one angler on each bank so that you get a view from opposite sides of the river. Once a trout is sighted, it is the spotter’s job to maintain a view of that fish while the angler gets into place and ready to fish. Teamwork can be vital in these situations and both anglers will be more successful if they are willing to work together and take turns. Tread lightly and move slowly. While I was in NZ, most of the time I took one to two small steps at a time with long periods of scanning in between. If there was any chance at all for fish to be holding in an area, I invested the time to scan each spot thoroughly before moving on. The times I got impatient and lost discipline were the times I saw fish streaking off after spooking. There’s no better way to ruin your chances of success when sight fishing than to walk leisurely up thinking you’re going to spot any fish that are around. Get as close as you can without spooking fish. The shorter the distance between you and your quarry, the less chance you’ll have of making a bad cast or a bad drift. If you have less line out you can make better drifts and more accurate presentations. Sometimes this may mean kneeling, crouching, or crawling into place to lower your profile and get closer. These efforts often pay big dividends. Be willing to make rig adjustments for each fish. Once you’ve spotted a fish, you must diagnose what rig to fish. If a fish is rising the choice is easy. If it’s suspended you still may be able to get it to eat a dry fly but a shallow nymph presentation may be a better choice. If the fish is glued hard to the bottom, you’ll need to match its level with your nymph(s) which may necessitate adding or subtracting weight or tippet. Because your first shot is often your only shot when sight fishing, you have to make it count. If you are too lazy to re-rig when your instincts tell you it’s needed, then your laziness will be rewarded with fewer trout. While I was in NZ, I brought a dry fly, dry dropper/nymph, and a Euro-nymphing rod on most of the rivers I fished. When spotted trout were on the move, this quick flexibility in rigging allowed me to target each fish with the best possible rig before it disappeared. Make a measurement cast. One of the best ways to improve your first cast to the fish is to get the length right. It’s easy to do by picking a spot that is the same distance away as the fish where you can make a cast without spooking it. Once you’ve made your cast and measured the amount of line it takes to get there, then you can reel in your line to that point so that you don’t overshoot your target on your cast. If you are working with a spotter and you can’t see the fish, the spotter can coach you into making a cast that will get you to the right length and then describe the location to direct your first cast to ensure you’re in the target zone. Set up your presentation with an aerial mend. 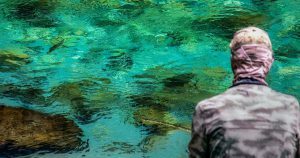 If the water is clear enough that you can spot fish, chances are that you don’t want to be making a commotion by mending line that might spook fish. In these situations, it is much better to make reach casts or other methods of aerial mending and drift management that will allow your fly to reach the fish in a natural manner without ripping mends across the water. Keep these tips in mind on your next outing. The more fish you see, the more fish you’ll catch! 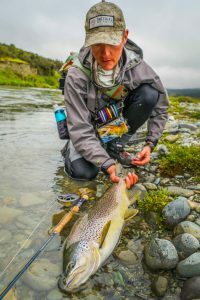 This entry was posted in Fly Fishing Tips & Technique, The Hot Ticket, Trout Fishing and tagged Eleven Tips to Increase Your Sight Fishing Success by Louis Cahill. Bookmark the permalink. Great article, Devin. I learn something daily while reading this blog. However you lost me on #11, i.e.. aerial mend and reach casts. Could you explain those terms further. Thanks. Would you delve a bit deeper into aerial mend, and reach casts. I’m not familiar with those terms. We’ve got you covered. Here’s an article and video. Great! the experience you have shared here is very useful for everyone who is planning about their fishing trip. Everything is important related to fishing like fishing rods, reels, flies, hooks and many more even cloths also. Above you have described the color combination according to the fishing spot is one best idea. Keep Posting. Devin – excellent article and – like your book & both videos – very thorough, clear and understandable! Quick question, what polarized sunglass lens color or colors do you use?